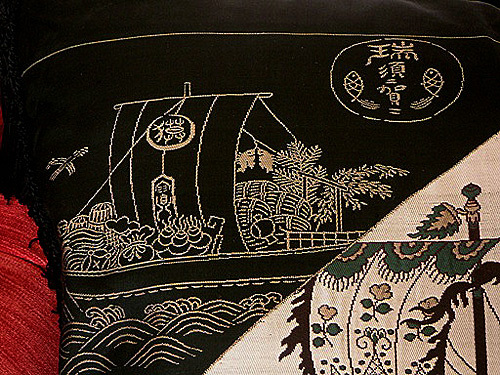 This masterfully hand woven inner back panel of a formal Haori has been hand woven in one of Japan’s most favored subjects: the Treasure Ship (“Takarabune”). 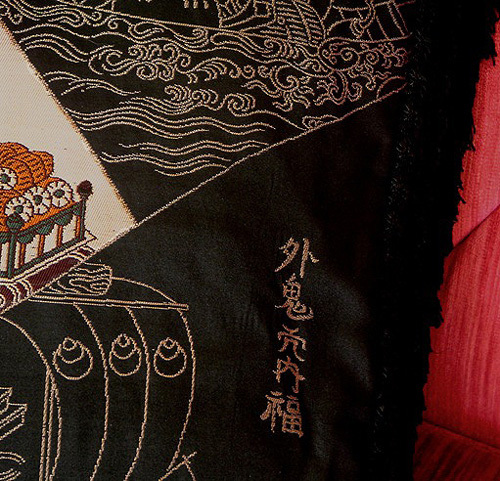 Ten precious objects are being carried on this ship, all of which are associated with the happy start of a new married life. 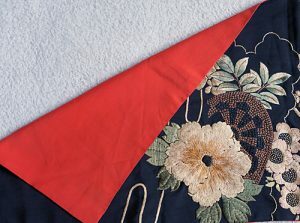 They are (1) the hiding cape (“Kakuremino”) in the shape of leaves that makes its wearer invisible; (2) the flaming treasure pearl (“Hoju”) which makes wishes come true; (3) the orange flower and leaves (“Tachibana”) promising succulent fruit; (4) the mallet of good fortune (“Uchide no Kozuchi”) whose blow produces wealth; (5) Seven Treasures (“Shippo”) in lozenge shape; (6) the treasure key (“Takarakagi”) to unlock the treasure house; (7) cloves (“Choji”) in elongated form whose fragrant blossoms are burned to purify the air; (8) hiding hat (“Kakuregasa”) which, like the cape, makes its wearer invisible; (9) merchant’s weights (“fundo”) made of gold and silver; and (10) a money bag (“Kanebukuro”) which keeps and produces wealth. At the leading edge of the Ship is a magnificent Dragon’s (“Ryu”) head leading the way over the rough seas and keeping the ills of the world from attaching themselves to the vessel. 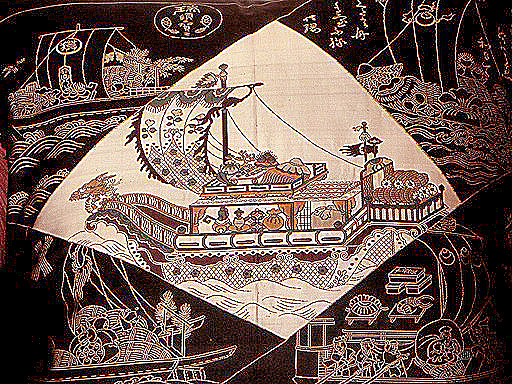 Around the Takarabune-filled diamond/lozenge center are arranged more fully detailed examples of ships along with the woven seals, signatures and kanji marvelously intertwined within the overall design. This extraordinarily fine weaving attests to the fact that only a Master Weaver could have completed such an intricate pattern, while only an individual of high status and wealth could have afforded to commission him to do so. 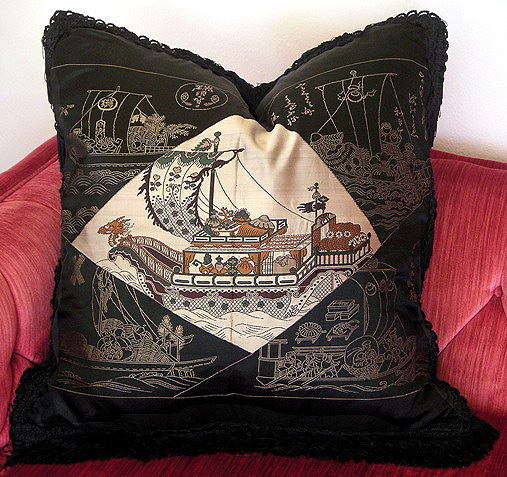 Antique Japanese textiles are among the world’s most virtuous examples of a craft elevated to an art form. To connoisseurs of fine art, these extraordinary pieces of fabric exhibit an artistic sensibility that is unique in the world. Silk topcoats (“Haori”) were required to be worn as formal overcoats by the upper classes in Japan. The secret that made each garment unique was the hidden artwork on the inside back lining panel. 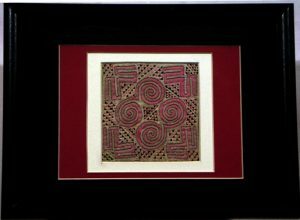 When the full Haori cannot be preserved for framing, the inner back panel becomes available for other decorative uses. 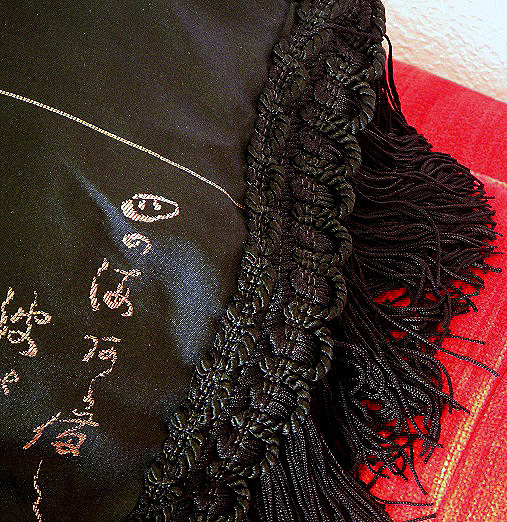 The back panel of each Haori was commissioned by its owner as an individual work of art, incorporating symbols of significance to the owner. 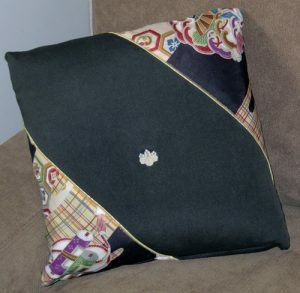 Thus, this Pillow displays the best of what was most important to an individual in Japan before the turn of the century. 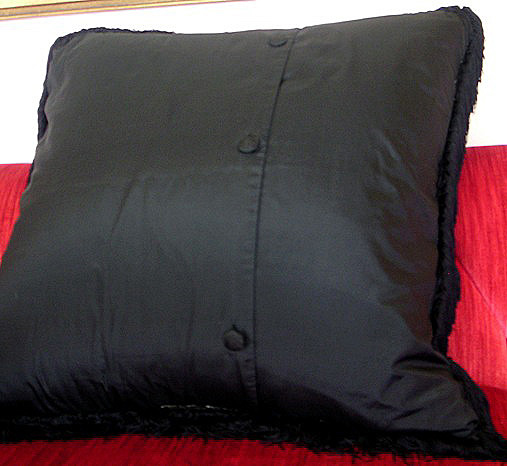 "Haori," or Formal Man's topcoat with the most significant aspect of that garment being the inside back panel. 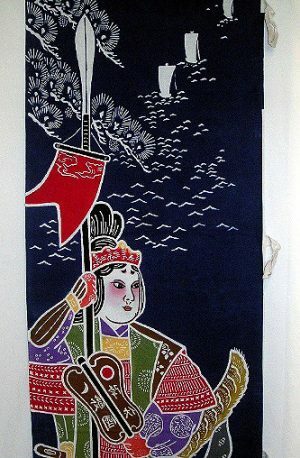 The inner back panel of this dramatic Haori has been finely hand woven in an extraordinarily detailed design with the inner portion showing a faint coral background.